This cookie is the result of countless hours of inner-debate over which decadent dessert to bake. Do I whip together my famous Chocolate Chip Cookies? Do I mix up some One Bowl Brownies? How’s a woman to choose between both sources of sugary splendor? She doesn’t. 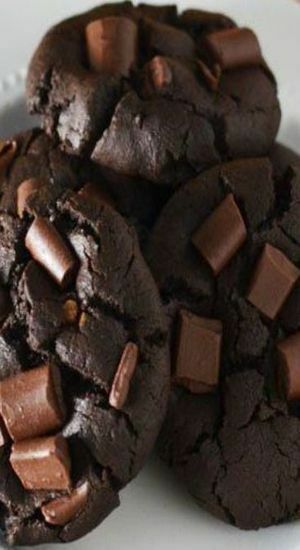 In times of crisis, she makes Death By Chocolate Chunk Cookies, the love-child of her favorite brownie and cookie recipes, complete with cocoa powder and melted chocolate to flavor the base, and gigantic chocolate chunks to keep things gooey. And then she writes about it in third person on her blog. In a large bowl, whisk together the flour, cocoa powder, baking soda, cornstarch, and salt. Set aside. 0 Response to "DEATH BY CHOCOLATE CHUNK COOKIES"